The experimental set up. Image: White et al. When NASA scientists think they’ve built something that breaks the laws of physics, do you take them at their word? 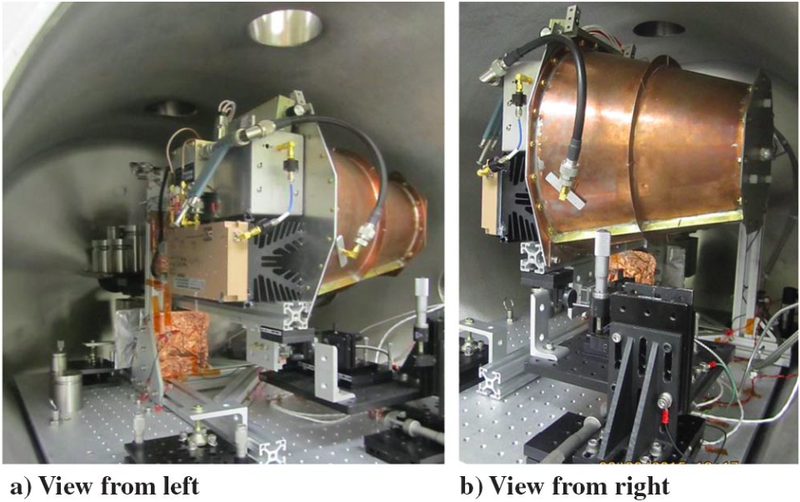 Folks have been buzzing about an “impossible” rocket thruster, one that looks like an air blaster you’d buy at Disney World and somehow generates thrust without propellant to push it forward, since forever. The so-called electromagnetic or EM drive makes headlines annually, but this year is different: an American team working on the drive released a peer-reviewed paper demonstrating that their prototype works, and a Chinese team claims that they’ve tested their own functional model. But physicists still aren’t sure about the results of these clunky copper cone tests, say nothing of their potential to lead to a Star Trek-esque warp drive as media outlets have suggested. The American team’s fairly simple experiment went as followed: they attached the engine to a weighted metal bar attached to a rotating axle, kind of like tethering it to a weathervane. The main EM drive shell connects to electronics including a radio frequency amplifier, tuned to a specific frequency, causing particles of light called photons to bounce around inside. The whole setup goes into a vacuum, and an optical sensor points right at the drive to see whether the darn thing has moved or not. If the pendulum on the optical sensor moves forward in a certain way when the scientists hit the switch, they’ve measured thrust. The experiment was well-executed, says Ray Sedwick, Professor of Aerospace Engineering at the University of Maryland. “They were very careful setting [it up] and minimizing error,” he told Gizmodo. The results are strange because moving forward requires some force acting in the opposite direction on some surface, according to Newton’s third law of motion. When you swim, you exert backwards force on the water to push your body forwards. Birds do the same thing with air, and when you walk, you push backwards with your feet. Rockets send propellant out of their exhaust system, and the EM drive... bupkis. Concerns arise when someone’s experiment breaks a fundamental law of physics. Sedwick personally would feel lot better if the NASA team “had the opportunity to redo the test in a larger vacuum facility where the [EM Drive] wasn’t so close to the wall of the vacuum chamber.” He thought unaccounted-for interactions between the drive and the experimental setup might have contributed to the strange forward-moving behavior. I also spoke with Eric Davis, Senior Physicist from The Institute of Advanced Studies at Austin, at Sedwick’s recommendation—Davis and Sedwick both sit on the American Institute of Aeronautics and Astronautics’ Nuclear and Future Flight Technical Committee. Davis also pointed me towards George Hathaway, an independent researcher in novel propulsion energy systems from Toronto, Canada. Both had concerns. “The observations they made did not justify the claimed anomalous thrust amounts they published,” said Hathaway. He felt that the NASA team based their theories on an assumption of what the thrust measurement should look like on their graphs, and that what they observed might not actually have been thrust but instead added heat energy changing the cone’s center of mass. Davis agreed with Hathaway’s assessment, and had even more problems with the paper’s speculative conclusion. Most science papers end with a discussion section, explaining the results and where they come from. The NASA physicists explained the thrust with some pretty wacky science—basically, by using a less popular interpretation of quantum mechanics, the engine could have pushed itself forward on the vacuum of space itself. Davis thought the researchers had presented garbled physics and didn’t the include important equations such a theory would require. “It’s just on and on nonsense,” he said. Harold White, the paper’s main author, did not respond to my request for a comment. Sedwick was less harsh on the discussion. “The fact that statements appear in the discussion section should not be viewed with the same authoritative eye as the stuff prior to that,” he said. He was, however, more cautious about the applicability of such a thruster. The EM drive produces around two percent the thrust as the most powerful Hall-effect thrusters available, which scoot orbiting satellites around. The small thrust offered by the EM drive would only be useful for long-haul space missions, ones that would otherwise necessitate enormous amounts of propellant. The EM drive thruster would only require a source of power, like a small nuclear reactor or solar panel. Sedwick didn’t want to speculate, but the distance at which the mass of propellant becomes so great that a much weaker thruster becomes an attractive alternative would certainly be further out than Mars, distances that would still take a long time to reach. The EM drive would travel pretty slowly, and certainly isn’t a faster-than-light warp drive like another much-blogged-about theoretical system, the Albucierre drive. As for the Chinese team’s test, the China Academy of Space Technology recently announced their positive results at a press conference, seemingly as a playground-type “yeah? well we built our EM drive, like, forever ago” taunt to the NASA team. According to IBTimes, the Chinese team’s EM drive is now undergoing zero-gravity testing aboard the Tiangong-2 space station. However, the team behind it hasn’t released test data to back up their claims like NASA has. Davis had only just heard about it when I told him.